The queen will usually provide the warmth and nutrition the kittens need, but sometimes you will need to help, or call your vet for advice. Warmth is important as newborn kittens can lose heat very quickly. If the mother is attentive, she will clean the kittens and use her body heat to keep the kittens warm. 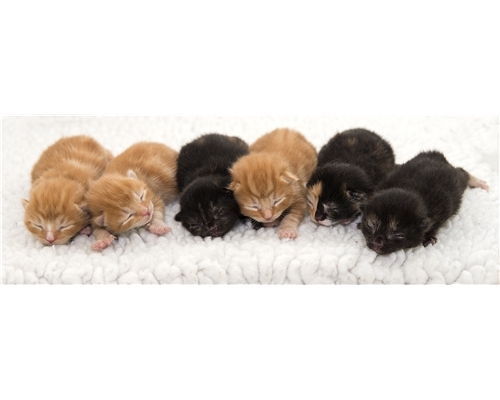 If she is tired or disturbed she may ignore them, in which case you will need to provide warmth, either via a heat pad or a covered hot water bottle - no hotter than body temperature - and the kittens should be covered with a light towel or blanket. Keep the room temperature warm and the bedding clean and dry. Feeding - the kittens should start to suckle from their mother almost immediately. If they haven't started after half an hour, gently guide them towards the teats. If the kittens don't start feeding, ask your vet for advice. You may need to start giving the kitten a substitute milk - but follow the instructions carefully. Remember, newborn kittens cannot go more than a few hours without milk. If the queen is calm and settled, you may wish to quickly and quietly check each kitten. Speak to your vet for advice if you have any concerns. Talk to your vet if you notice any unusual behaviour. If you need to take the queen to the vet, ask if you should transport the kittens with her. If the kittens are to stay at home, make sure they have adequate care, including warmth and food, while the queen is away.